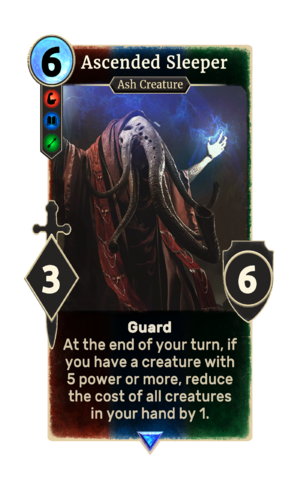 Ascended Sleeper is a rare House Dagoth creature card. It is part of the Houses of Morrowind expansion. "This is but a dream, waking over and over." "Poor animal! You understand nothing." This card's ability applies the Ascended card effect. Ascended Sleepers first appeared in Morrowind. This page was last modified on 27 February 2019, at 23:57.